With Surface Plasmon Resonance (SPR) and diverse surface chemistries, scientists have discovered an invaluable tool with which to investigate molecular and cellular reactions in fields including immunology, molecular biology, cell biology, biochemistry, and many others. The quality of the data obtained with this technology depends mainly on the sensor chip surface, where the biomolecular interaction takes place, and is transduced into an optoelectronic signal. 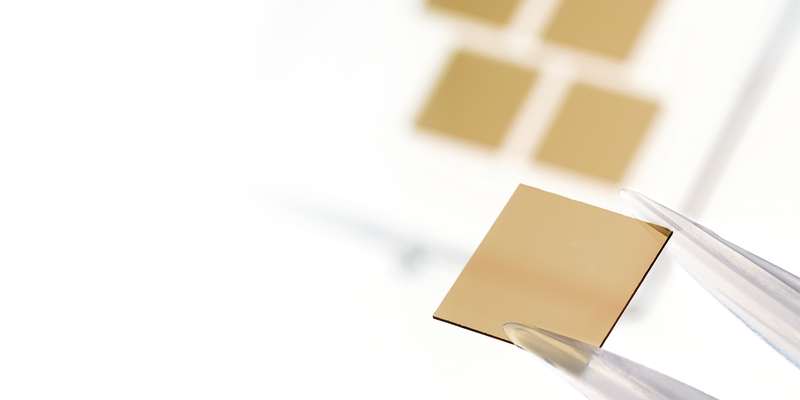 For twenty years, XanTec bioanalytics has provided laboratories worldwide with the ultimate in SPR biosensor chips with superior coating technologies. As the biochemistry is extremely versatile, a large choice of topcoats is available to specifically address different experimental needs. Previous innovations from XanTec, which have eliminated several drawbacks of sensor surfaces currently on the market, are now being utilized extensively by corporate and academic users on a variety of SPR instruments. These include hydrogel-based sensor surfaces coated with the linear polycarboxylate HC that significantly improve diffusion characteristics and inhibit the non-specific interactions which occur with carboxymethyl dextran (CMD)-based sensor surfaces. Also included in this HC group are ultra-stable poly-NTA (NIHC) surfaces. Until now, the use of CMD-based NTA surfaces was limited due to their high leaching – this does not occur with the new NIHC chips. Zwitterionic polycarboxylate surface (ZC). This unique surface has been developed for the immobilization of negatively charged molecules such as DNA, carbohydrates or proteins with low pI, making them now accessible for covalent immobilization. In contrast to all other commercially available sensor surfaces for covalent binding, this surface creates a positive net charge during the pre-concentration of the negatively charged biomolecule and its covalent immobilization. The zwitterionic polymer surface is currently available with NHS/amine surface chemistries – others will soon follow1. 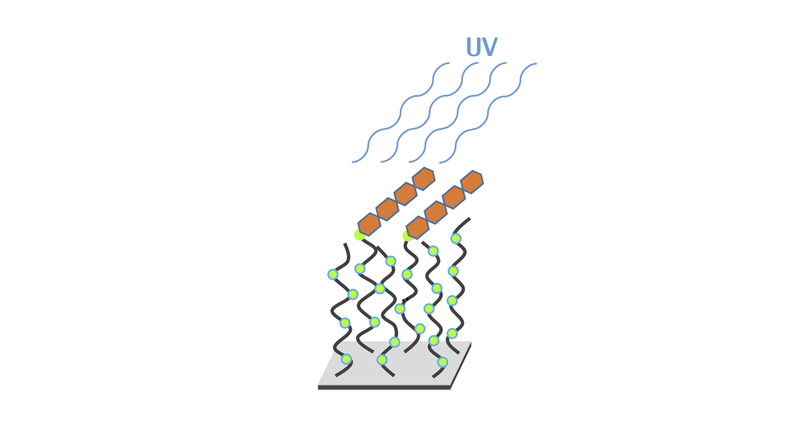 UV crosslinking surface (UV). The UV crosslinking surface2 makes immobilization as easy as 1-2-3. Let your molecule of interest pre-concentrate on the surface, then irradiate with UV light. A high immobilization yield and an immobilization chemistry which targets many functional groups such as OH and NH2, as well as less reactive C-H and C-C bonds, allows the immobilization of carbohydrates and smaller molecules which are not accessible through traditional NHS/amine coupling. This surface is compatible with the Reichert 2SPR equipped with a UV flow cell and SPRi instruments using external spotters, as well as spotting of microarray slides. Hydrogel and hydrophilic planar surfaces with lipophilic anchor groups (LD and LP). The 3D hydrogel LD surface has been optimized to capture whole vesicles and liposomes. Covalently attached to a hydrophilic polymer, lipophilic alkyl chains act as "anchors" for embedded particulates containing lipid membranes. On the 2D LP surface, the lipophilic alkyl chains are linked to a planar carboxymethyl dextran layer (CMDP surface). 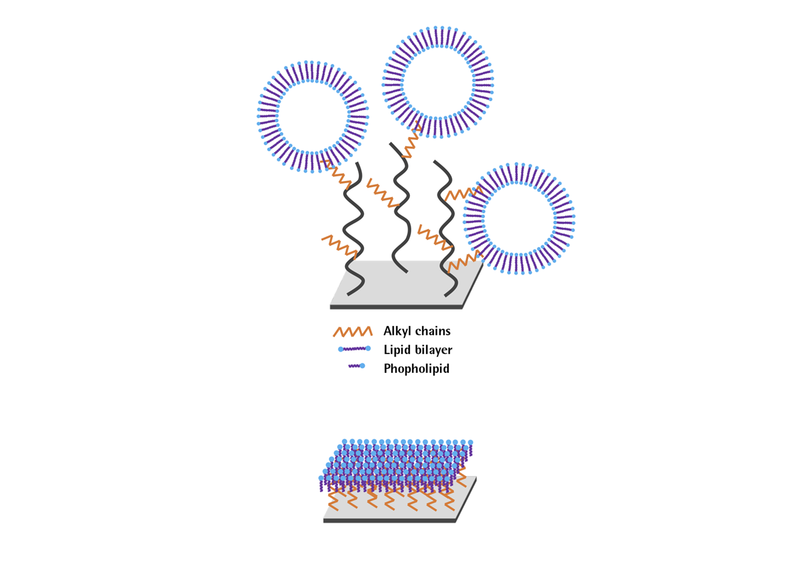 In contrast to the hydrophobic alkyl SAM modified surface (HPP) that immobilizes lipid monolayers, the LP chip is the ideal substrate to prepare supported lipid bilayers. Such 2D structures can be simply prepared by vesicle spreading and mimic the cell membrane. LD and LP surfaces are suitable for analysis of membrane protein–protein interactions or membrane protein–inhibitor interactions. Ultra-high capacity carboxymethyl dextran (CMD) surface. For more than a decade, XanTec has offered the widest variety of CMD surfaces. Different thicknesses (planar, 50, 200, 500 nm) and three different porosities make it possible to tailor the chip surface to the size of the ligand/analyte and the application. This family has now grown further. Aiming for the highest immobilization capacities on CMD sensor chips, especially for fragment and small molecule detection, we have launched the CMD 700 nm chip. Some proteins are difficult to immobilize to sufficient levels on sensor surfaces based on CMD 500 nm, for example when the available protein concentration is too low, or when a buffer needed to retain protein activity is not optimal for immobilization. On such occasions, the higher capacity of the CMD 700 nm sensor surface offers the opportunity of achieving acceptable binding levels. Contact us today to make the most out of your assay and optimize your data. Our application specialists are available to answer any technical questions and will happily discuss your requirements. Please also refer to our publication citations.